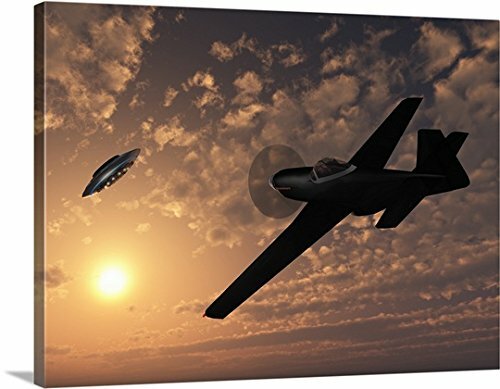 Mark Stevenson Premium Thick-Wrap Canvas Wall Art Print entitled An American P-51 Mustang gives chase to a UFO 40"x30"
Our proprietary canvas provides a classic and distinctive texture. It is acid free and specially developed for our giclee print platforms. The fabric base is flexible to support tight corners. The finished print is mounted on a sturdy board to protect against shrinkage, deforming or over-stretching. Each print is produced with our own archival UV quality inks supporting a vibrant color gamut, while being scratch and fade resistant. Our photographic grade pigment based inks were developed for outdoor advertising products and are designed to withstand a wide range of environmental conditions. Each premium canvas gallery wrap finished with a closed back preventing dust collection inside the back of the wrap. The back includes a pre-installed, ready-to-hang sawtooth hardware. Our stylish framed wraps also come with pre-installed hanging hardware built into the frame. This frames are made from a recycled material that makes them environmentally friendly as well as solid, durable and lightweight. Made in the USA. 365 day workmanship guarantee. Archival-quality UV-resistant inks. Pigment-based and designed to last. If you have any questions about this product by Canvas on Demand, contact us by completing and submitting the form below. If you are looking for a specif part number, please include it with your message.